This is the last post that is solely focused on pumpkins this year. I promise. I’ve had a good, long run with the pumpkin re-dos this fall. The last few that I did were taking my real ones and giving them a light shot of metallic spray paint so that they would transition from Halloween into Thanksgiving. Those pumpkins? I made them frosty pumpkins. I always feel like I’m in a bit of a decorating limbo from the Friday after Thanksgiving until the day in early December when Handsome Hubby first has a chance to get my Christmas boxes down from the rafters. With these guys sitting around it looks like winter is almost here. The perfect thing while waiting for the Christmas season to begin. You’ll need epsom salt, coarse glitter, fine iridescent glitter, craft glue and spray adhesive. Make sure you have epsom salt and not rock salt. You want your pumpkin to be frosted, not sprayed with gravel. Generously brush craft glue over the top of your pumpkin and shake the epsom salt over it. Next I use the spray adhesive over the top of the epsom salt. (I don’t think it even matters if the craft glue is still wet) Sprinkle the coarse glitter, then follow up with a dusting of the fine iridescent glitter. Remember, salt melts when it gets wet, so don’t leave these where they can get wet. This one was here just long enough for the picture, because of the sprinklers. Move it to a covered area or keep it indoors. There you have it: the Last Pumpkin Post of the Year. sniff, sniff. 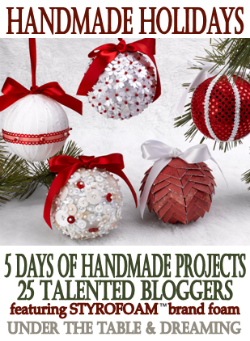 Under the Table and Dreaming is having a Handmade Holidays series. My project went up yesterday evening, so please go check it out my Glittery Epsom Salt Snowman. (Yes, epsom salt might very well be the new pumpkin…) Go check out the great projects running all this week. I do believe that you are the Pumpkin QUEEN! You can’t see me but I’m bowing at your greatness oh Pumpkin Queen! I can see your crown is transitioning to Epsom Salt Queen based on all of the cool projects I’m seeing around blogland with your name on them! I saw your snowman/epsom salt/styrofoam project yesterday and they are ADORABLE. Love love LOVE!! 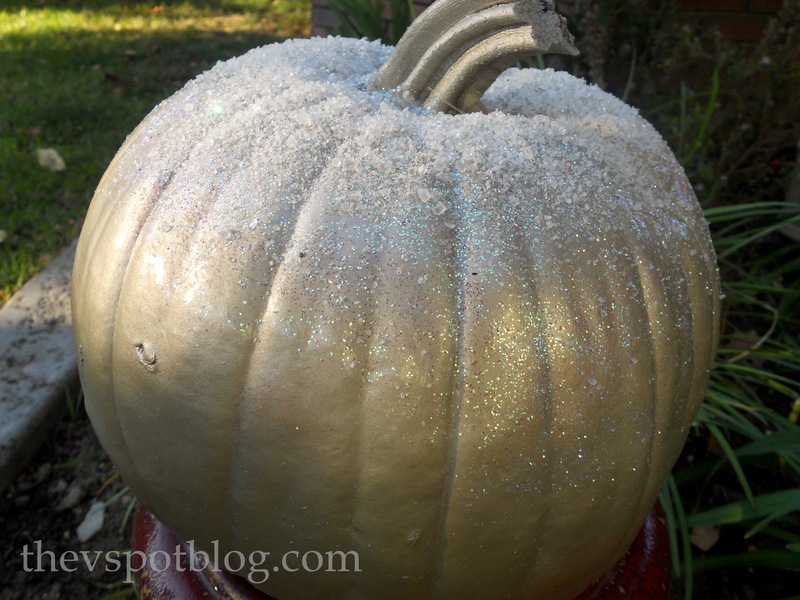 This is fabulous – that frosted pumpkin is soooo pretty!! This is brilliant, Vivienne! What a great idea!! But I have to admit that I hate to see the pumpkin posts come to an end. They’ve been so much fun to read! wonderful you are so creative! What a fabulous ides! I never thought of using Epson salts!! Cool! Perfect!! I love this idea! The frost looks so pretty on your pumpkin. 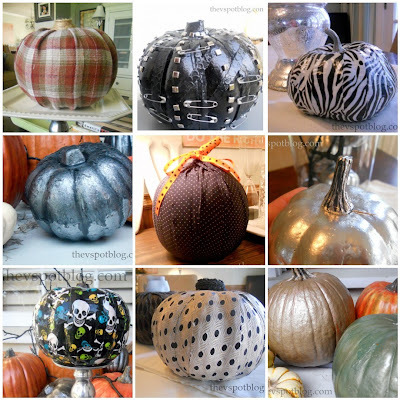 Personally I think pumpkins can stay out all year – I love them! You are the pumpkin queen and I think you need a pumpkin crown!